After a lot of hard work, dedication, and late nights at the HS, we have our results from this year’s Regional Science Fair! On behalf of the students, Mrs. Harvey, and Mrs. Randolph, we would like to sincerely THANK all the parents, administration, and particularly staff members who accommodated, encouraged, and supported these students! For a complete list of participants, their research, and their awards click here. Monte Vista students attended the FBLA District Conference in Alamosa at Adams State University. Eleven Students placing at Districts will attend the State Conference in Vail on April 19-21. On October 22 the MVHS PirateBot Robotics Team received the "Best Rookie Team" Award at the SoCo BEST Robotics "Bet the Farm 2016" Competition at TSJC in Trinidad. They competed in 15 rounds and 3 semi-final rounds to take home the award. 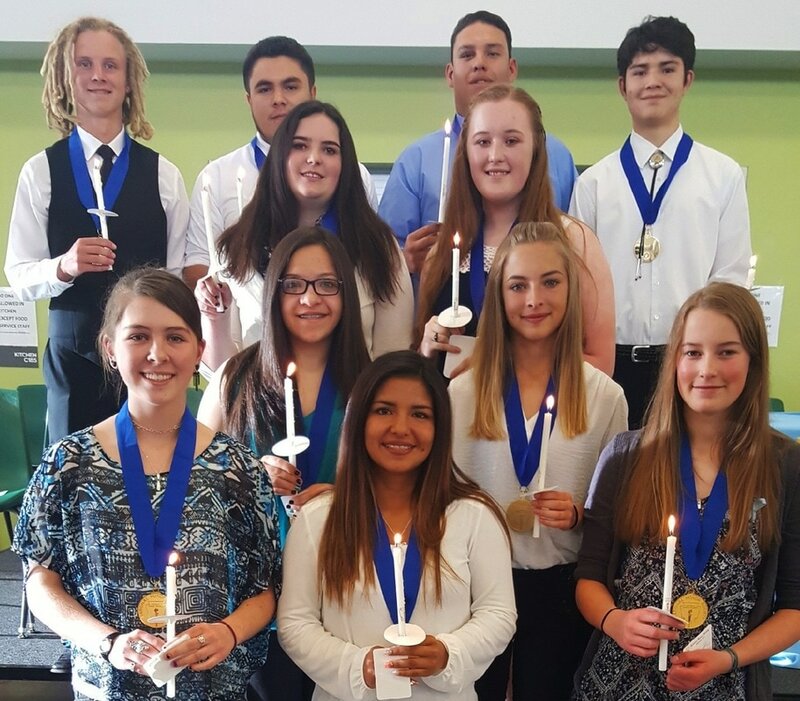 The Monte Vista High School chapter of the National Honor Society inducted 11 new members at a ceremony on April 24th. For consideration the students must maintain at least a 3.65 GPA, perform community service, show leadership and good character. Those pictured are (front to back, l-r): Alyssa Rawinski, Kaitlynn Porter, Molly Nehring, Amanda Avila, Amber Michel, Trinady Gonzales, Grace Beckner, Parker Randolph, Luis Espinosa, Cedric Perea and Derek Medina. This year’s CSEF hosted approximately 330 excellent projects with over 400 students attending. Our students performed exceptionally well during the judging phase, and participated in all sorts of science-related tours across the CSU campus. Each of these students worked extremely hard to reach this level of competition, and did an outstanding job representing themselves, our science program, and the district as a whole. One notable accomplishment is that ALL nine MVSD finalists “made the stage” and placed at some level for a Grand Award, a feat not seen for several years at CSEF (this is an extremely competitive fair)!! Congratulations to them all, and THANK YOU to the parents, school board members, administration, staff, and sponsors who helped make this trip a huge success! 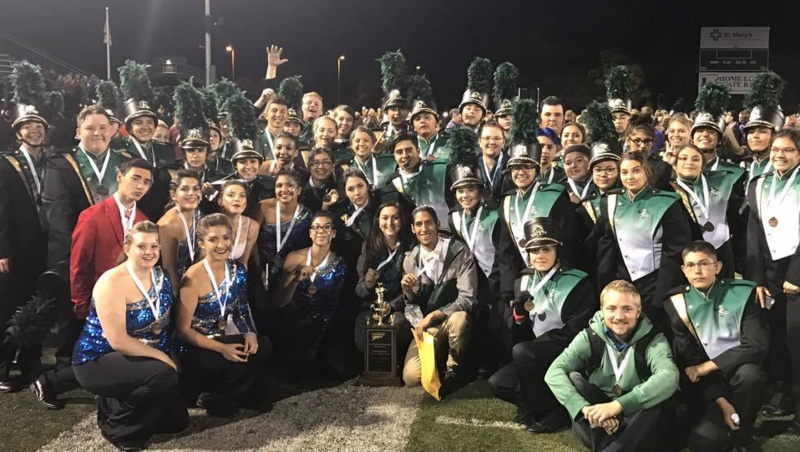 ​After early mornings, long rehearsals, sleepless nights, and countless hours of hard work, our students placed 3rd at CBA State Marching Band Championships on October 31st. The last time Monte Vista placed in the top half of the 1A competition was in 2011 when only four schools competed in the Championships.